My love for sushi started at around age 14. Like any beginner sushi eater, I started with the ever so safe “California Roll” and eventually became brave enough to try some beautiful creations that this wonderful cuisine has to offer. I’m still a little wary though. I am coming out of the stage where I need massive amounts of rice with my sushi rolls, which is a relief because when I eat sushi I like to eat until I am the size of a roll myself. The amount of rice I consume contributes to my new, lasting “roll” figure. 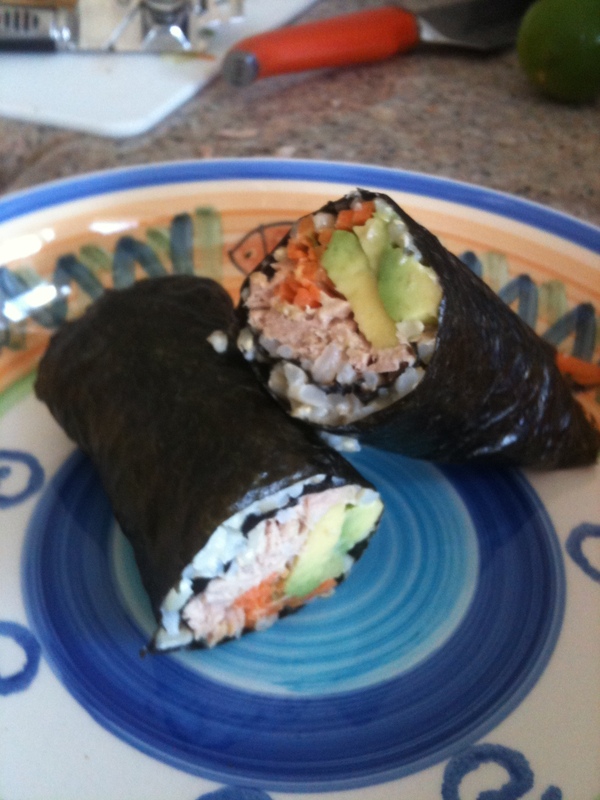 I also prefer to have avocado with nori rolls. I just really love the flavor combo and felt that it was enough to make up for the decrease in rice I was going to use with my nori rolls. Besides, we can all use a little avocado in our lives, considering how healthy avocados are. This fruit is high in monounsaturated fatty acids as well as other vitamins and minerals such as vitamin K, folate, vitamin C, fiber and potassium. 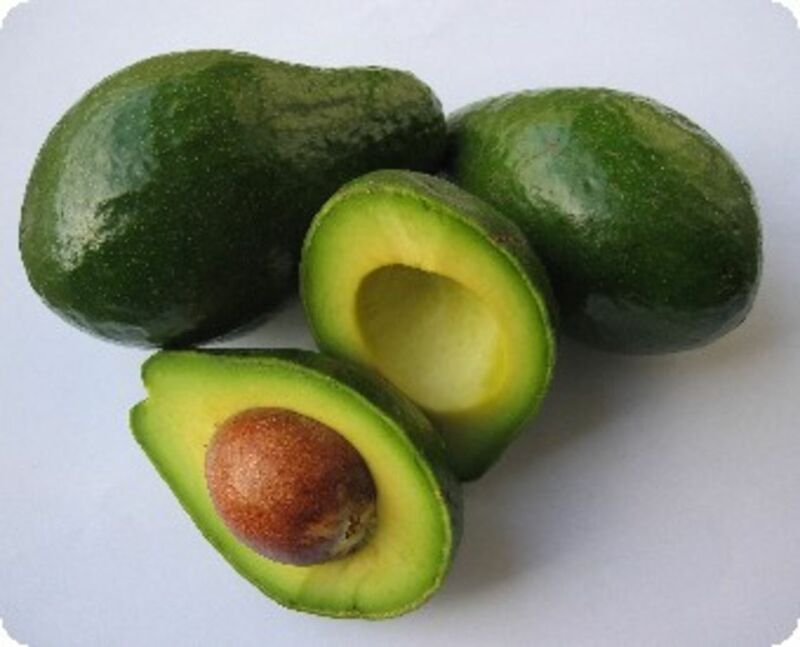 Look at all the health benefits avocados provide: reduces risk of cardiovascular disease, contains anti-inflammatory and anti-cancer properties, and even aids in blood sugar regulation thanks to the amounts of fiber and healthy fats. 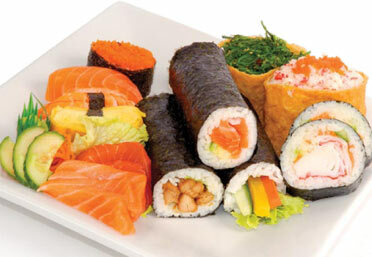 Here is another reason to hit up your fave sushi spot tonight: Nori, which is a type of seaweed, is super healthy. 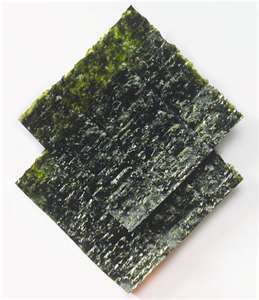 There are many clinical studies on the health benefits of eating seaweed. There are components in seaweed that “exhibit many beneficial biological activities such as: anticancer, antiviral, anticoagulant and antioxidative acting properties.” You will find that seaweed is also high in Iodine, which is important for thyroid function. Making my own sushi has allowed me to save some bucks on the days when I am really craving sushi but just don’t want to spend the money. The sushi rolls I made are so easy and quick to make- feel free to add whatever your heart desires. 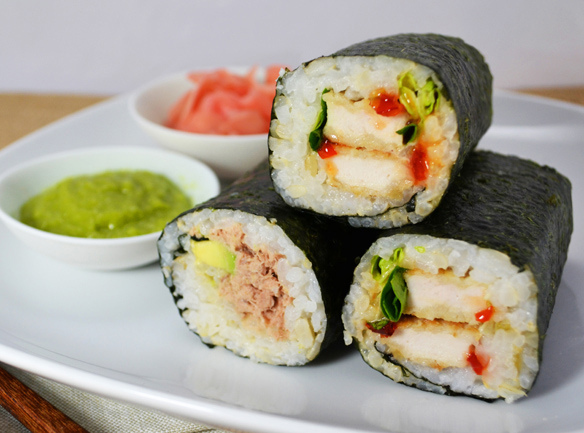 Here in Australia, they add chicken to sushi rolls. Heck, my friends Amanda and Matt Terillo saw a kangaroo sushi roll while visiting us! I was shocked, but then again, why not??! Mix tuna, celery, mayonnaise and lemon juice together. Mix until it is all coated nicely with the mayo and has made a delicious tuna salad. 1. Place nori sheet down on sushi rolling mat. 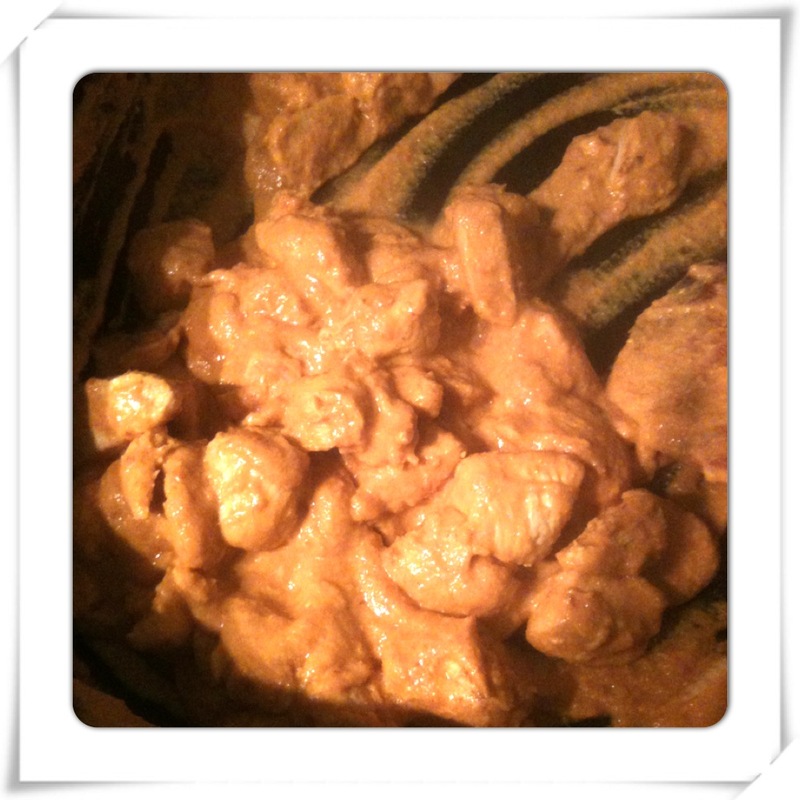 Add 1/4 cup brown rice and spread it across. Make note that the rice isnt supposed to cover the entire sheet of nori, like typical sushi does. 2. 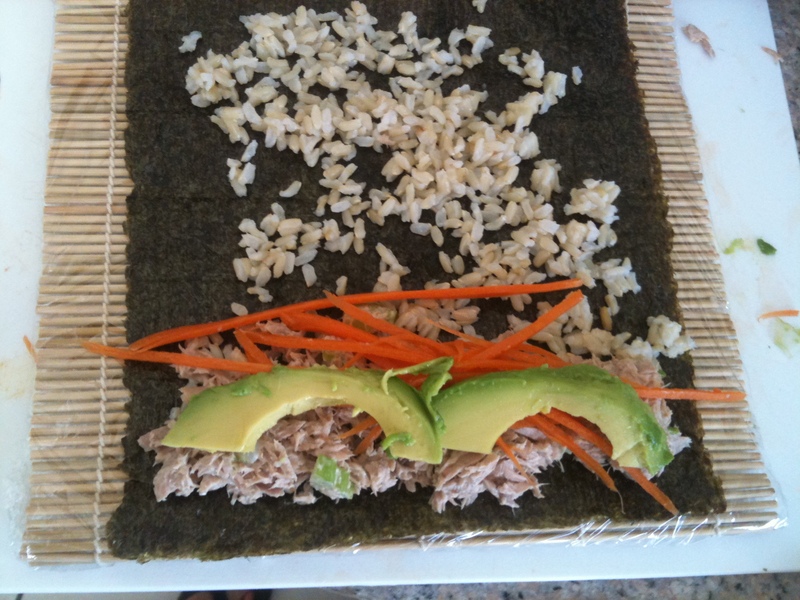 At the end of the nori sheet, add some tuna salad along the edge. Top it with some carrot, followed by 2-3 slices of avocado. 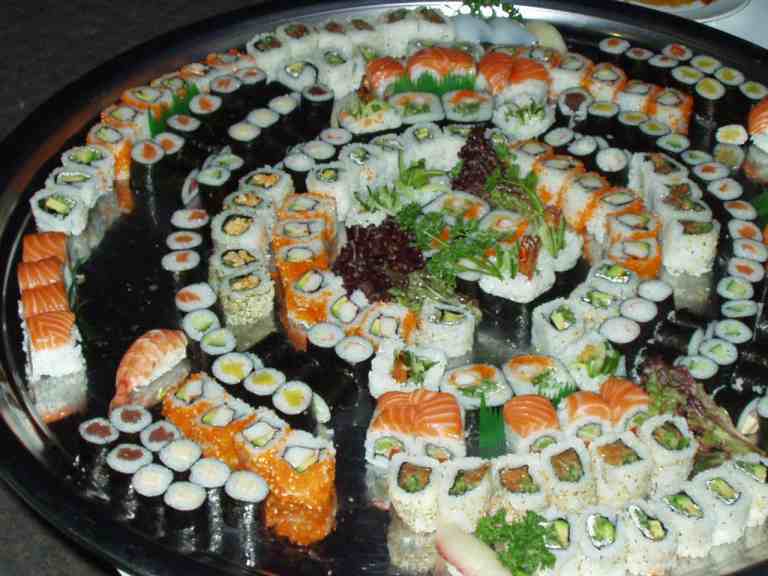 Roll the sushi the best way you know how. Confession: The first time I made sushi, I used a youtube video as a guide 😉 have no shame! I found that 3-4 halves was enough for me as a meal. 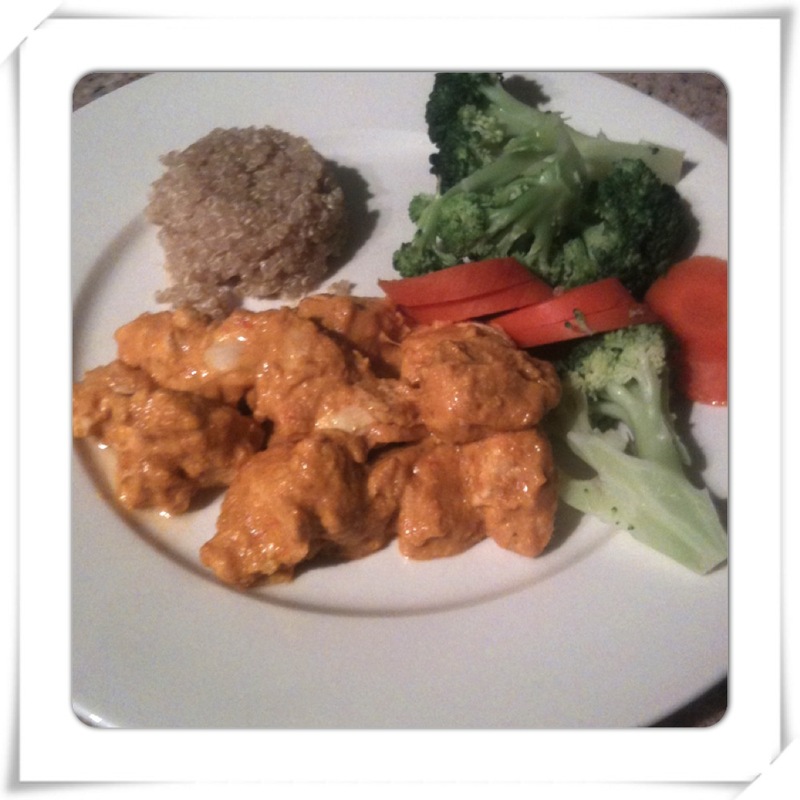 I used brown rice because it is high in fiber, vitamins and minerals compared to white rice. Dont have brown rice? Use your favorite grain or plant seed. I think next time I will use quinoa! Get creative and use other veggies such as cucumber, peppers, even sweet potato! I would eat them within two days of making them. So feel free to make a little extra and take to lunch the next day. Just remember to store them in the fridge. Don’t have access to a sushi rolling mat? Try wrapping a thin magazine with plastic wrap. 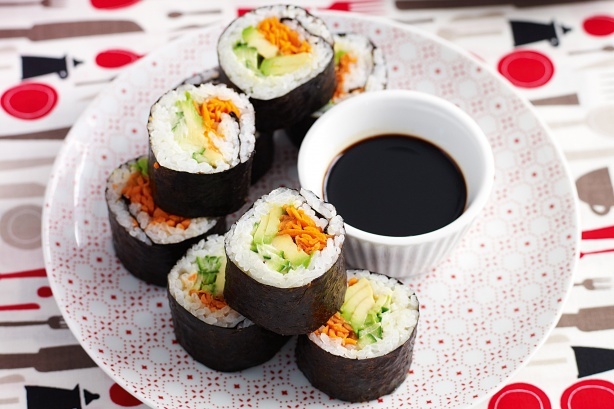 Place the nori sheet right on the magazine, place ingredients on the nori sheet and roll away. I am currently obsessed with Instagram. Partly because it’s the only social media that works on my phone at the moment, but mostly because it is loaded with health and fitness minded individuals that are also creative and super dedicated to their lifestyle. It’s become a huge motivator for me and I am inspired everyday by these wonderful people. I highly suggest you create an environment that is filled with people who share the same lifestyle you have or are working towards having. 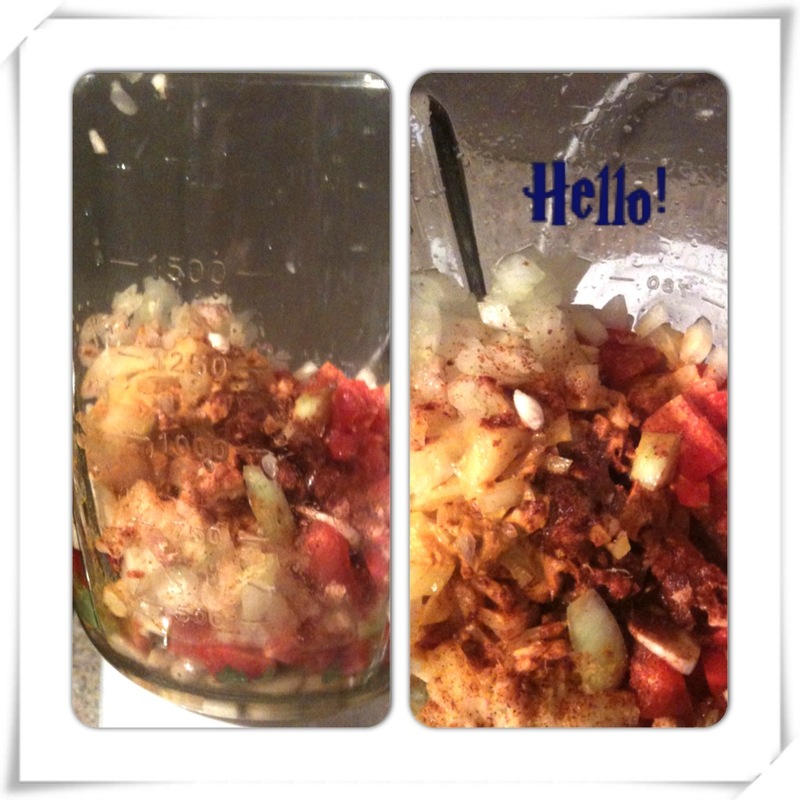 So, this blog post is about a recipe posted by one of the Instagram profiles I follow: food4health. He posted about an “African Peanut Chicken Stew” which I have been trying to make for weeks! The time has come and I am finding myself wishing I would have made it sooner. I changed just a few things from the original recipe and it still came out BANGING! MMMM! What I love about this recipe is that it is made with clean, whole foods. The sauce is full of antioxidants and immune system boosting ingredients. It tastes phenomenal and is also gluten and dairy free! Omit chicken and replace it with a non animal protein source and you have yourself a vegan meal! I’m thinking tofu and chickpeas would do the trick. I have used quinoa as my “starch” for this meal. 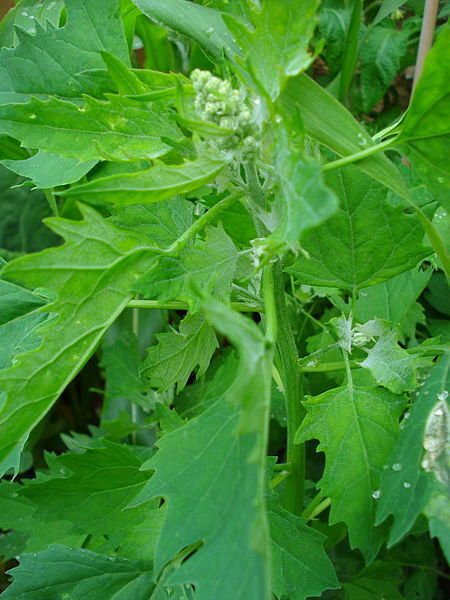 Remember, quinoa is not a grain, it is a plant seed. Click on the link and read all about why it’s so good for you on a past blog post. 1. Add 1 cup dry quinoa OR brown rice to 2 cups of water. Bring to a boil, cover and simmer on a low flame/setting for ~20 minutes for quinoa or ~40 minutes for brown rice (or until all water is absorbed for both). Fluff with fork and let stand until ready to serve. 2. Meanwhile, throw in first 12 ingredients in a blender. 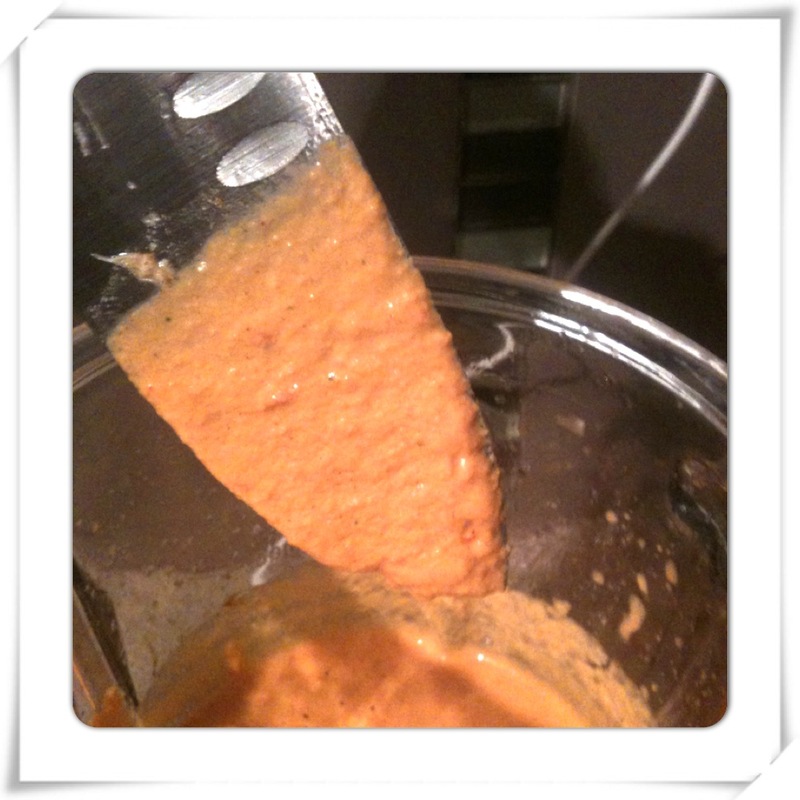 Blend until you have a smooth sauce, consistency of a smooth paste/thick sauce. Now is a good time to taste test and determine if it needs more salt, ginger, garlic, spices, etc… to meet your liking. 4. Steam veggies to your desired consistency. 5. Serve it up on a plate all nice and pretty and gobble it up. Remember: If you fail to prepare, you prepare to fail. 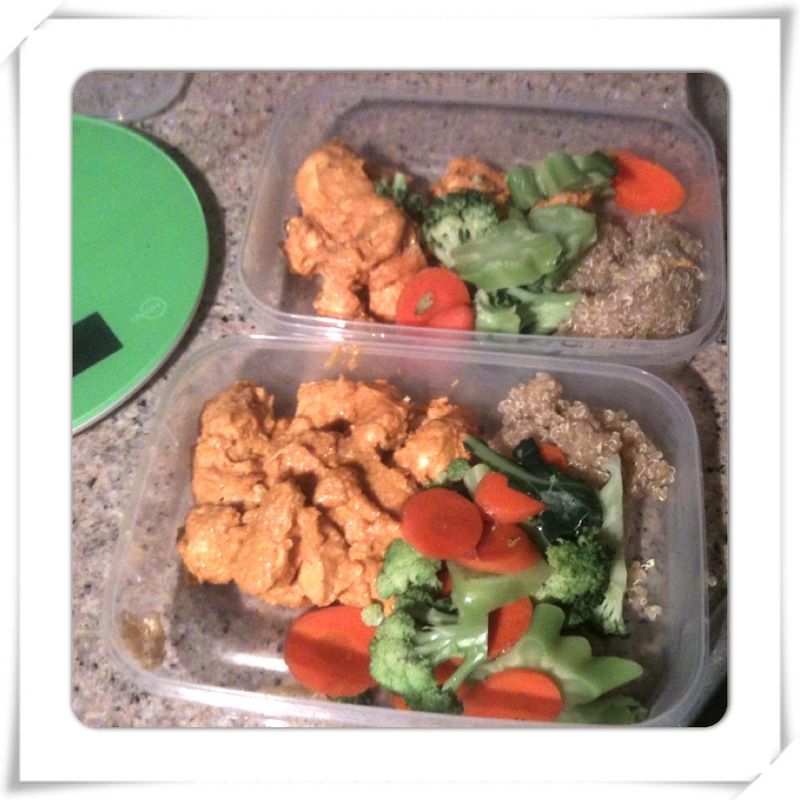 Here are two lunches for tomorrow-score! I can’t wait to eat you tomorrow! EAT CLEAN! TRAIN MEAN! LIVE LEAN! 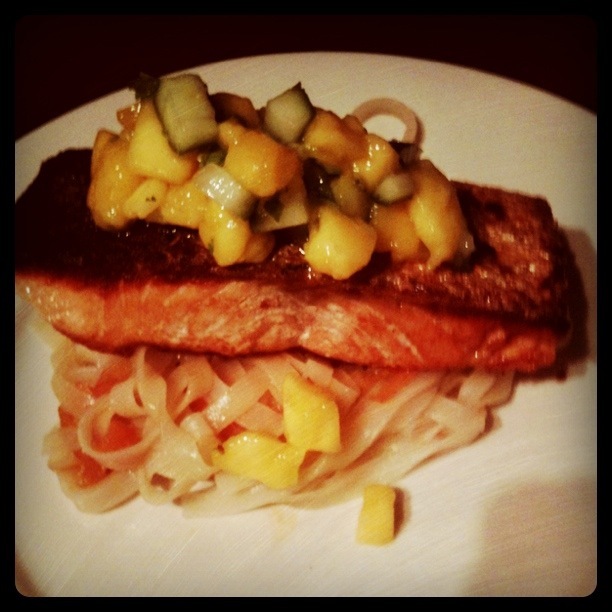 So far we have had our mango salsa on grilled chicken breast with coconut rice, as well as crispy skinned salmon. I hear it goes well with other types of fish and even Mexican style cuisine, such as Fish/ Shrimp Tacos. I’m sure there are different recipes out there for a mango salsa. The one I am providing is super simple, yet has lots of flavor. Feel free to experiment with other ingredients you think may add to the recipe…and please share them with us! 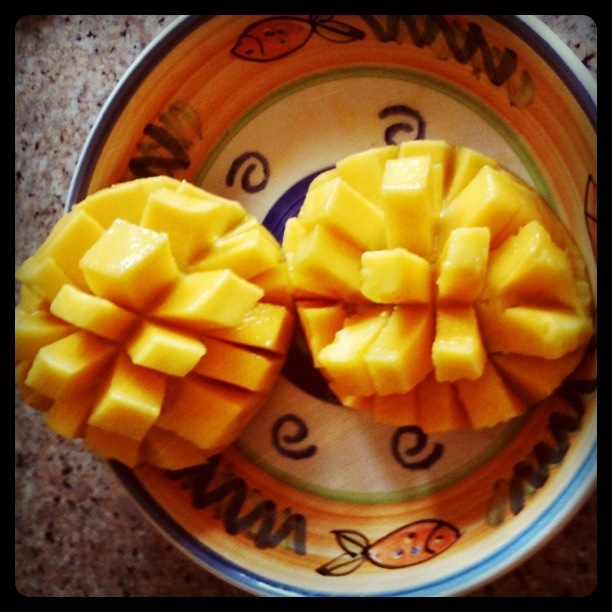 To chop the mango, I found that cutting along the sides and scoring them like a grid was the easiest. Then take a knife and carefully slice along the skin and underneath the flesh. You may have heard of “Clean Eating”. It is a concept that revolves around eating foods in its most natural form, cooked with very little or no artificial ingredients/flavors. My husband and I have decided to adopt to this clean eating regimen due to the bottomless french fries bowl which is constantly available at work our new-found love and appreciation to living a healthy, active lifestyle. This eating regimen really forces you to be creative in adding flavor to your meals using whole foods and none of that preserved, artificial, shelf life stuff. On our way home from the gym one day, we were having a bit of a winge over our usual steamed broccoli, carrots and mashed sweet potato. I suggested we make a quick stop to the supermarket. What were we to buy? I didn’t know yet. What I did know was I had 5 minutes to figure something out. Since spring season has just blessed us with its presence, I knew I wanted to make a salad. I find that Asian inspired salads always have a fresh, clean taste to them. 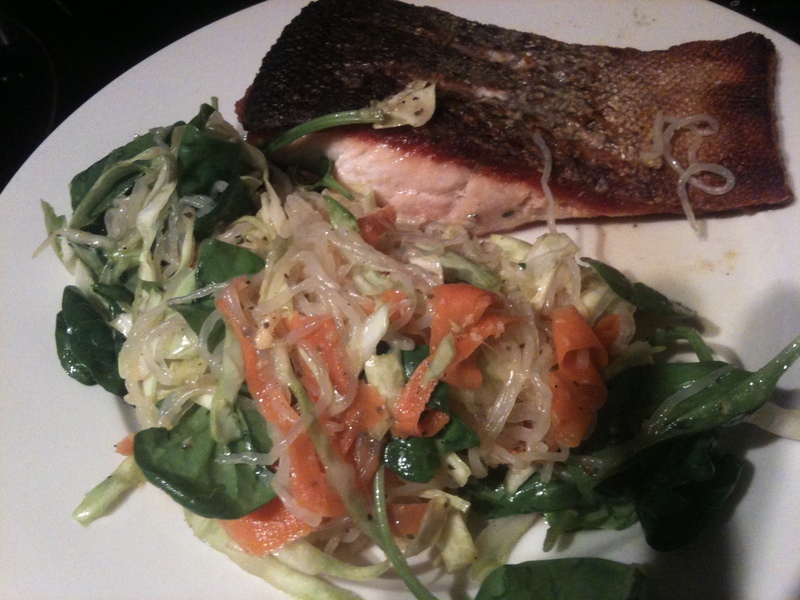 So I opted for Crispy Skinned Salmon and an Asian noodle salad. My key ingredients were garlic, ginger and fresh lime juice. I knew with these three ingredients I would be able to make a clean and healthy meal with HEAPS of flavor! Unfortunately the picture below does not do it justice. It was one of the tastiest meals we have had in a while and is now a household favorite. 1. Use a sharp knife to cut two slits on the skin side of one salmon, length wise. Do the same for the other Salmon fillet. Each slit no deeper than 1/2 inch. 2. Sprinkle salt in each slit and over the skin of salmon. 3. Add a very generous amount of oil to a pan. Get the pan screaming hot, then carefully add the salmon fillets skin side down. Let them sit for ~5 minutes. Flip over and cook through to your liking. 1. Cook Rice Noodles according to its package. 2. Combine grated ginger, soy sauce, salt, pepper, honey, lime juice and rice wine vinegar and whisk together. 3. Combine cooked noodles, sliced carrots, chopped cabbage, and fresh coriander/cilantro in a bowl. 4. Add the dressing, followed by 3 TBSP Olive oil to the salad and toss together. Rest the salmon fillets, skin side up, on a nice heaping serve of Asian salad. Dig in and enjoy the clean, crisp and super tasty flavors of this healthy, delicious dish. I was able to get my hands on some Quinoa, one of my favorite “grains” that is becoming increasingly popular. 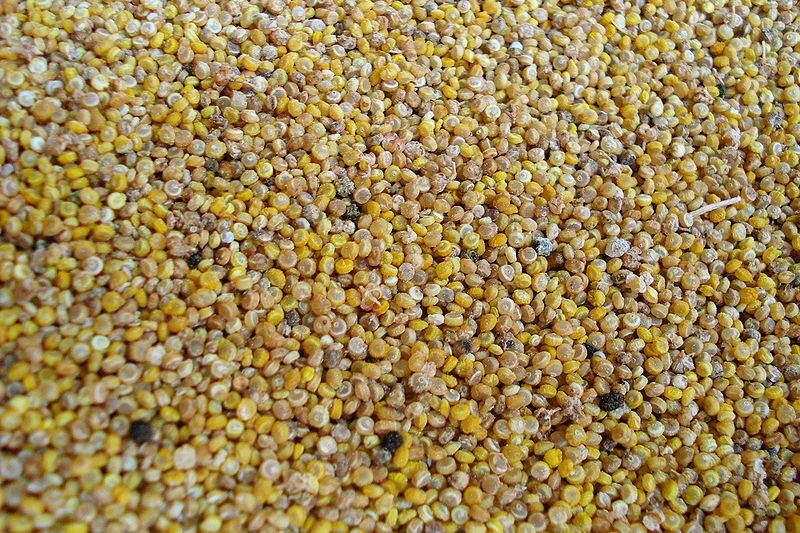 If you haven’t heard of it yet, allow me to introduce to you the “Mother Grain” that is Quinoa (pronounced: Keen-wah). To be clear, Quinoa is not a grain, it just happens to fall into the category of grain. Its actually a plant crop that is grown primarily for its seeds, and it is the “seeds” that we cook and consume. Or you can just let me sum it up for you and tell you that you NEED this food in your diet. Its high in fiber, vitamins and minerals and contains a good amount of amino acids, antioxidants and even essential fatty acids. Who knew such a small food could make you so healthy and strong?! Get a large pot of water to boil. 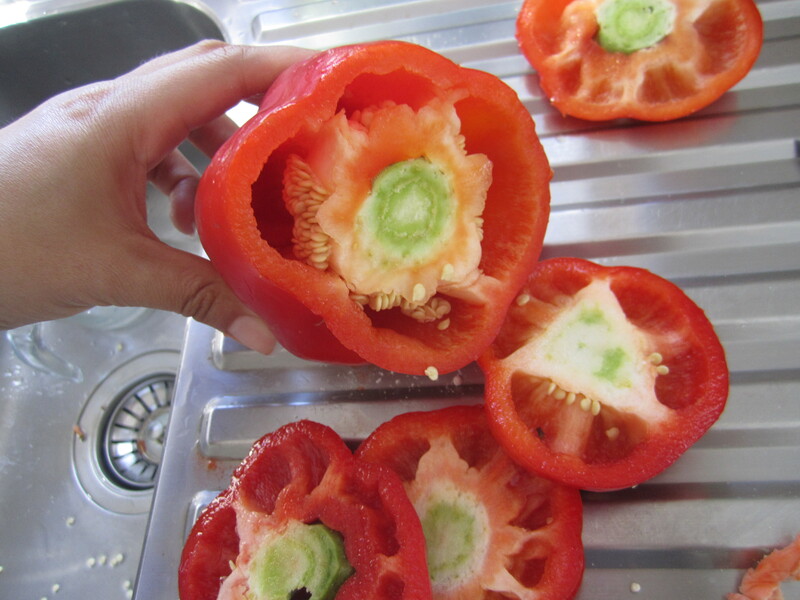 Cut the tops of the red peppers and remove the seeds and linings of the pepper. Place them in the boiling water pot for ~7 minutes. In another pot, start cooking the quinoa. 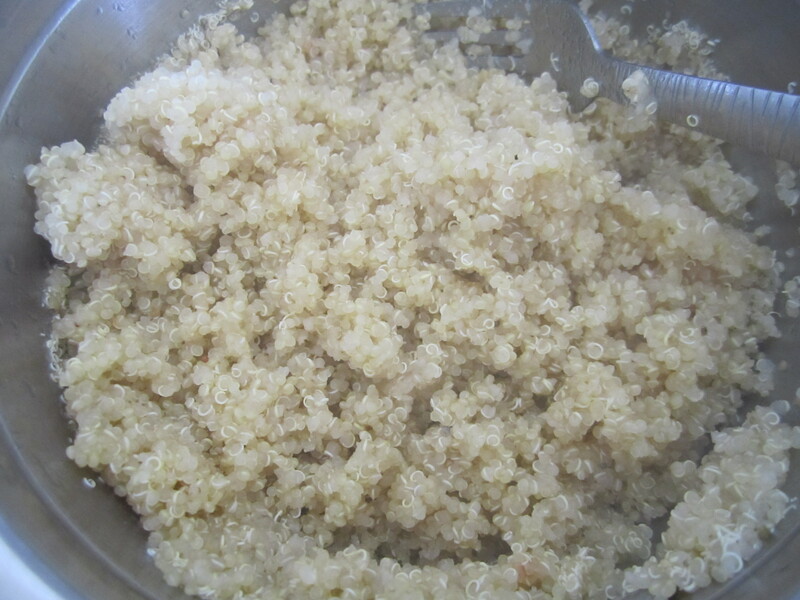 Add 1 1/2 cups water to 3/4 cup dry quinoa. Bring to a boil, and reduce to a simmer for about 20 minutes, or until all water is absorbed (just like rice!). Remove from heat for about 10 minutes and fluff with fork. 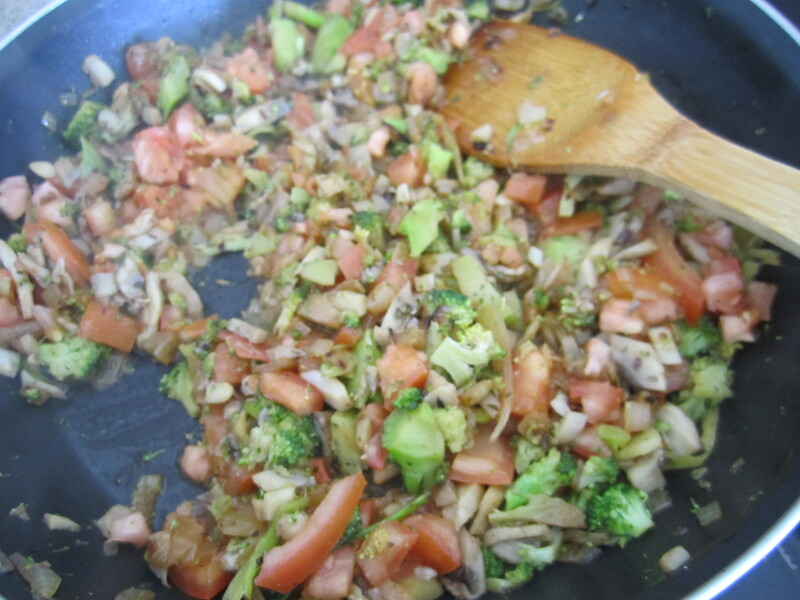 Meanwhile, in a pan, add some oil, sautee onions for about 5 minutes, followed by broccoli, mushrooms, and chopped tomatoes. Sautee for another 5-8 minutes. Once quinoa is finished cooking, add it to the vegetable mixture and toss until combined. 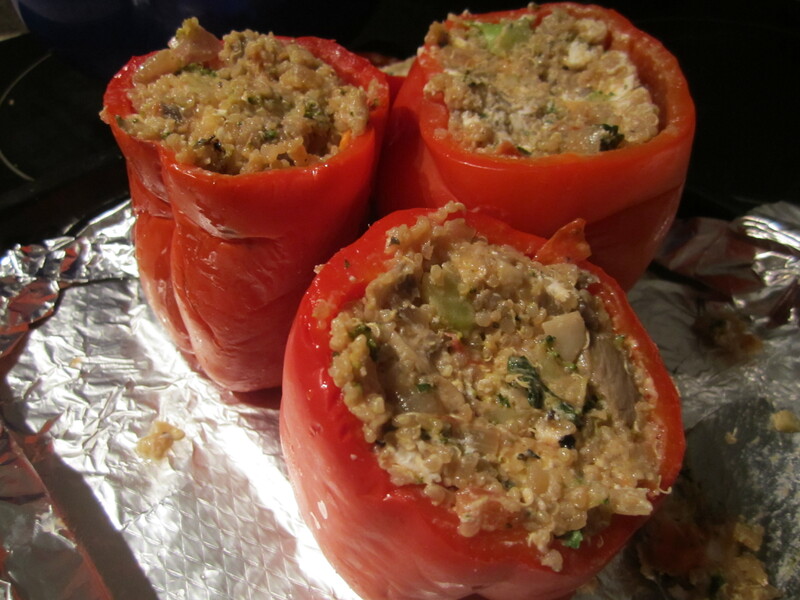 Scoop the quinoa veggie mixture into the hollowed out red peppers until topped off. Grill the stuffed peppers until the sides are charred. (You may have to turn them once or twice) ~ 20 minutes. 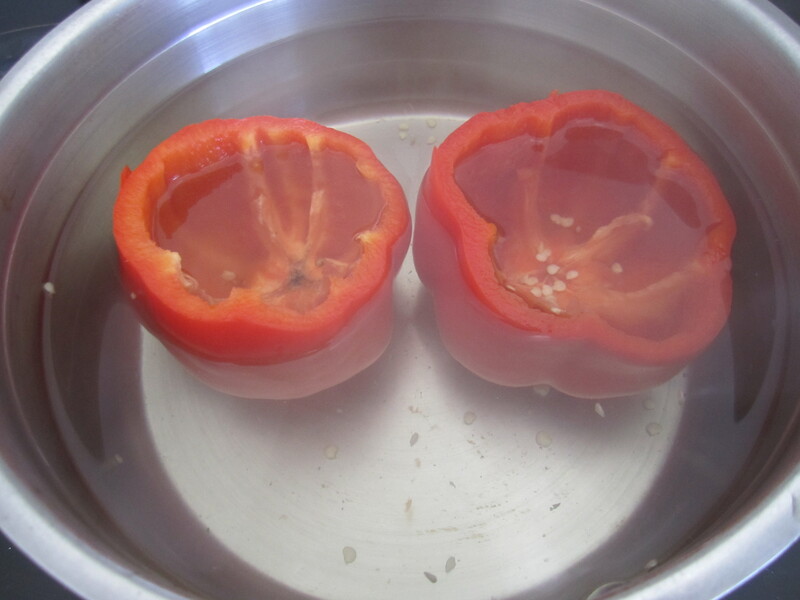 Remove from heat, peel the charred skin off the pepper to expose the soft, tender skin underneath. 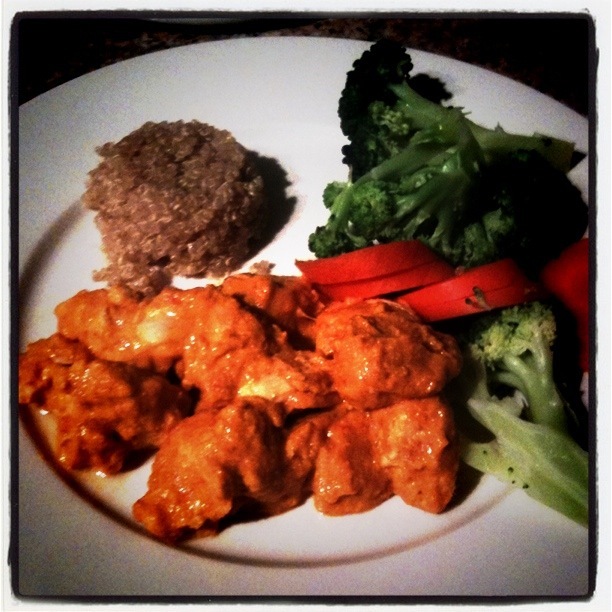 Enjoy a gluten free, karma free dinner! Stir up some Stir Fry in 1,2,3! 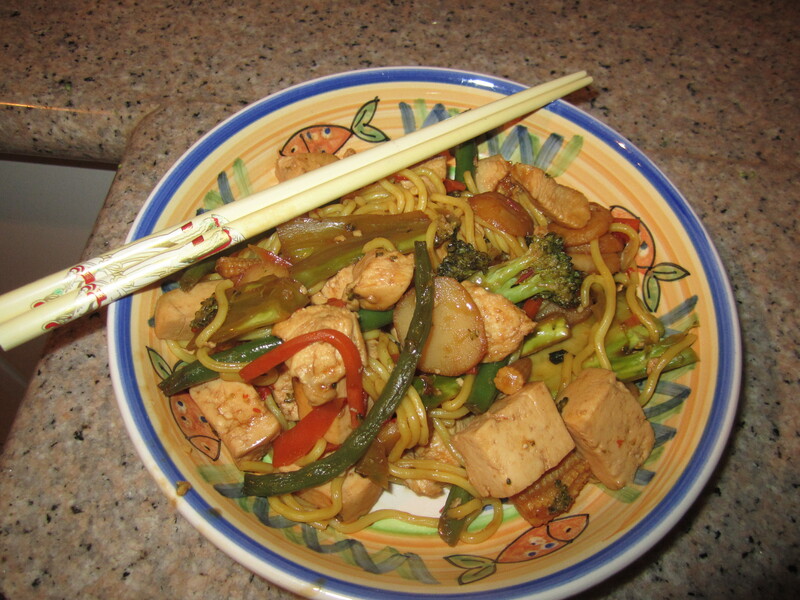 I also love cooking Stir Fry because you can make a large amount and have some for lunch/dinner the next day. Lastly, my absolute favorite reason to eat Stir Fry is because you get to choose YOUR favorite vegetables and…YOU CAN EAT IT WITH CHOPSTICKS! This is a meal that you can involve your kids in helping to cook. They can help wash, peel, and if old enough, cut the vegetables. They can add the vegetables and sauce to the wok or pan. They can help stir the veggies and serve up the plates. A wok (in Cantonese) (simplified Chinese: 镬; traditional Chinese: 鑊; Jyutping: wok6) is a versatile round-bottomed cooking vessel originating in China. It is used especially in East and Southeast Asia. 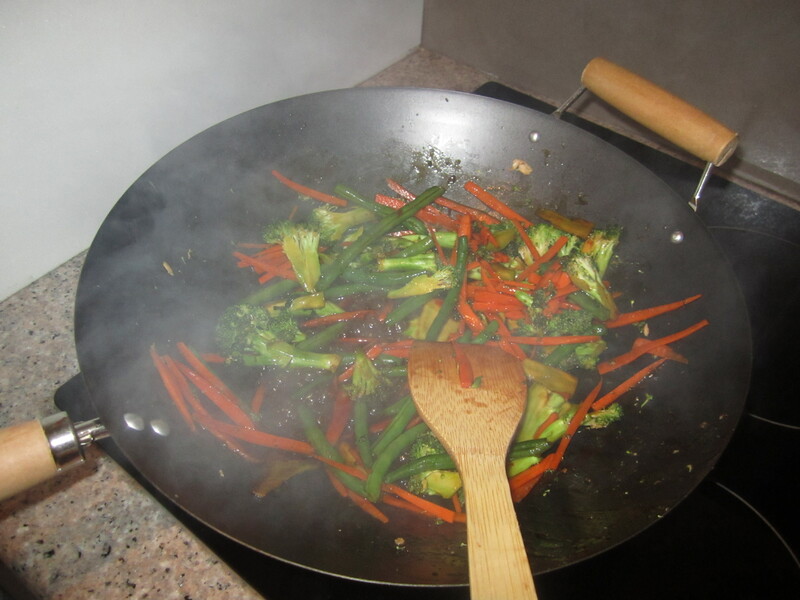 Woks are most often used for stir frying, but can also be used in other Chinese cooking techniques, such as in steaming, pan frying, deep frying, poaching, boiling, braising, searing, stewing, smoking, making soup, roasting nuts or vegetables, or even fermenting rice wine. Wok cooking is done with a long handled chahn (spatula) or hoak (ladle). The long extensions of these utensils allow the cook to work with the food without burning the hand. Furthermore, the rounded bottom shape allows the food to be tossed around easily so that food may be cooked at the bottom of the pan and along the sides. 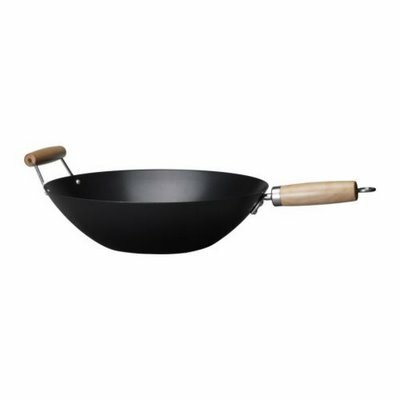 Woks are found in any kitchen appliance store or section of a department store. Ikea sells them for $10! Pick your favorite vegetables. 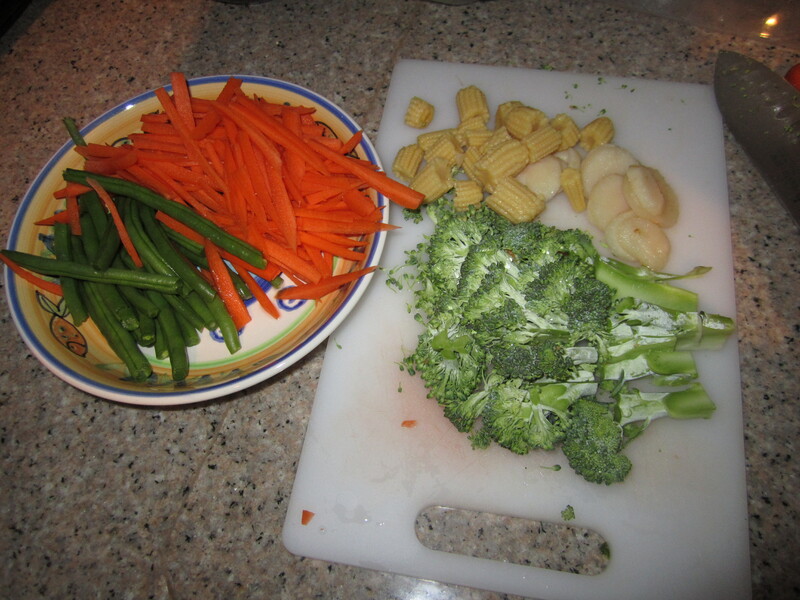 For the Stir Fry I cooked tonight, I chose broccoli, carrots, baby corn, water chestnuts and string beans. Pick your sauce of choice. This is a biggie because this will determine the flavor of your dish. I used teriyaki, soy sauce and sweet chilli. There are so many sauces to experiment with: Hoison sauce, oyster sauce, black bean sauce, peanut satay…don’t be afraid to try new flavors. You can add rice or noodles to add more volume to your dish. A wooden spatula so the wok does not get scratched. Add canola oil or peanut oil to wok. At the last minute of cooking, add a few more TBSP of sauce and toss well. Add rice or noodles if desired. Serve it up and enjoy!! What is in your Stir Fry tonight? You might have heard of this phrase before. 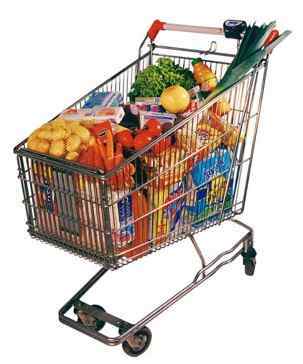 It’s a new approach that teaches about how to change your food shopping routine to make your cart well-balanced, cheaper, and of course, HEALTHIER!!! Sticking to the method of Shopping Around The Perimeter will ensure that you choose foods that are fresh, wholesome and closest to its original form. 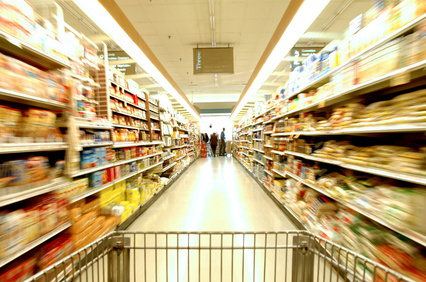 My final thought: If you must purchase foods in between aisles that I have not recommended above, PLEASE be smart about it and read the nutrition label and ingredients list. Choose foods that are low in sodium (less than 250mg per serving), low in fat (less than 3g saturated fat per serving), and low in sugar (the lower the better!). 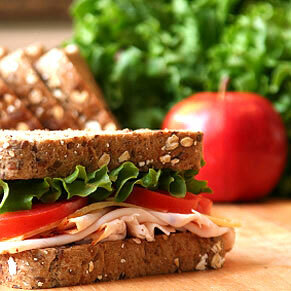 The less ingredients the better and always remember to choose foods closest to its original form!